The Groundsmaster® 3500-D is a revolutionary triplex rotary mower designed for superior performance mowing. The free-floating Contour™ Plus cutting decks allow mowing of undulating terrain without scalping. The powerful Kubota®, 35 hp (26.1 kW) engine and exclusive Series/Parallel traction drive system, gets the mowing job done quickly. The Sidewinder cutting units shift left and right a total of 24 inches (61 cm). This increases the cutting unit overhang for precise trimming. The tyre tracks can also be shifted within the mowing path to reduce wear on the turf. Deluxe seat adjusts to let you customise your work environment and reduce fatigue. Plenty of space at the operators station paired with easy-to-read controls increases comfort. Plus the steering wheel tilts for steering preference. Kubota® 35 hp (gross) turbocharged liquid-cooled, 3-cylinder, diesel engine provides an abundance of power to handle demanding mowing applications. The new Contour™ Plus cutting technology takes quality of cut to a whole new level. Air inlet pockets keep the grass standing tall for the cleanest possible cut, while an acceleration baffle speeds clipping circulation and assures maximum power. In addition, a unique directional vane and modified discharge opening deliver even clipping dispersion. An optional mulching kit is also available. Unlike any other mower on the market, the Groundsmaster® 3500-D allows you to be more productive. 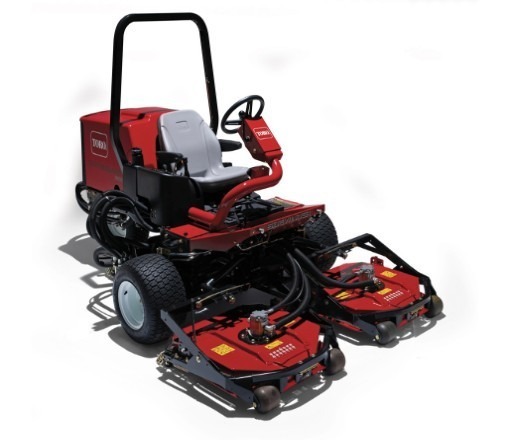 The 68` (173 cm) width-of-cut allows you to mow generous swaths, yet its compact size and the Sidewinder® system also allow you to make tight manoeuvres in trim areas. So places that might normally require you to use one or two different machines can be handled by one. The patented Toro Series/Parallel™ traction drive system provides steady traction in all conditions, even in wet grass and over undulating terrain. Its full-time, 3-wheel drive system maintains power to two of the three wheels at all times, minimising tyre spinouts and scuffing.